The Winter NAMM show (the bi-annual trade show for the National Association of Music Merchants) starts tomorrow in Anaheim and I'll have a full report on the trends, revolutions and evolutions on Monday. Whether this is your first time at Winter NAMM or you've been going for some time, here are a few things keep in mind while you're there. Zero In On What You Need To See And Go There First - If you've seen a product announcement in a magazine that you'd like to check out, go to that booth first before you look at anything else. NAMM is large enough and spread out enough that it's very easy to get sidetracked and never see that item or not be able to spend enough time checking it out when you do find it. Look For Trends - Sometimes it's best to breeze through a particular hall without stopping at any of the booths, just to get a feel for a trend that might be happening. Maybe you'll notice that a lot of manufacturers are offering guitars that spew white foam this year. After you notice the trend, it's good to circle back and get the story from each manufacturer as to how that model came about. That way, you can find out who has the best foam, who came up with the idea and who's a copycat, the technical differences between manufacturers, and get a better idea about retail pricing. Listen To The Buzz - It's easy to be overwhelmed at the show. There are so many manufacturers and so many new products that it all becomes a blur after a while. That's why it's best to start asking people that you meet, "What did you see that you liked?" or "What's the coolest thing at the show?" You might find out about the latest thing that you would've never checked out otherwise. Don't Waste Your Time With The Majors - The major manufacturers (Yamaha, Roland, Fender, etc.) have huge booths that can soak up your time with little to show for it. Each major will have dozens of new products, most of which are a slight evolution from last year's model. If you haven't heard the buzz on a new product from a major, it's best to find someone who works for the company at the booth and ask, "What's the coolest new thing that you're showing?" That way, you'll spend a lot less time seeing things that aren't especially groundbreaking, so you'll have a lot more time to find the things that actually are. Check Out "Inventors Row" - One of the most overlooked areas at Winter NAMM is "inventors row" down in the basement. These are mostly small manufacturers that may be at NAMM for the first time, but if you're going to see anything that will make you say, "That's a good idea," this is where you'll find it. Inevitably when I get together with my show compatriots, this is the area we discuss the most. Stay Away On Saturday - Saturday might be the most fun if you've never been to NAMM before, but then again, it might not. Saturday is the most crowded day of the show, has the most gate crashers (people who don't work for a retailer or manufacturer and technically aren't supposed to be there), has the most celebs (their demos have huge crowds that have a waiting line), and is the hardest to get anything accomplished. If you want to speak with the manufacturers, play with some gear, attend some demos, and not get jostled around by the crowds, try any one of the other days instead. Have fun, and maybe I'll see you there! 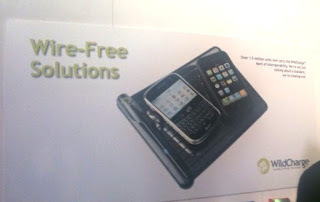 One of the things that I enjoy most about any trade show is finding the smaller, under the radar trends. Sure, everyone is all hyped up about 3D, 1080p and tablet computers. But a few other things popped up that are worth taking a look at. But since I mentioned tablets, let's go there for a second. 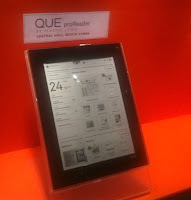 I understand that there was a section of the show floor that was dedicated to tablets but I never found it. 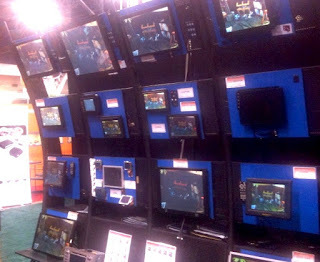 One of the things I did see was assorted tablets, mostly by unknown Chinese manufacturers. They weren't as abundant as the press might have you believe, but they were around. But as a pundit said (don't remember who), it doesn't matter how cool one of these devices is if there's no software ecosystem around it. Most of them make a pretty nice paper weight right now. A trend that was pretty interesting was in the power department. There were a lot of after-market battery makers around, each touting a higher capacity than the next. That being said, one of the cooler things available was the abundance of wireless power devices. Just put your phone, iPod, whatever on the matt and it charges it up. 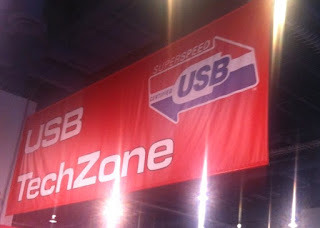 As mentioned in a previous post, USB3.0 (Superspeed USB) made its debut at CES and did so with a splash. If you've not heard yet, USB3 sports a speed in excess of 10 times faster than Firewire, with the ability to fully power peripherals like external drives and such. I wasn't overwhelmed by the number of devices that featured the new interface, but you could tell that it was going to be everywhere next year at this time. 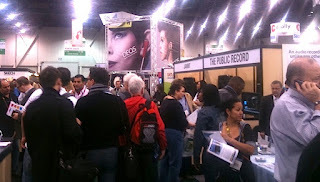 As stated in my first CES post, green was an underlying theme at the show. 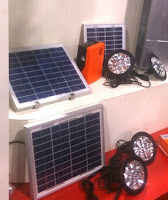 That being said, there were a lot of companies (again mostly Chinese) that featured solar cells and solar powered devices. It was hard to walk 10 feet without bumping into something having to do with solar on some level. Yeah, it's not a trend but it caught my eye. Don't like your mouse? How about a model car instead? You can feel like a kid again and still get some work done. 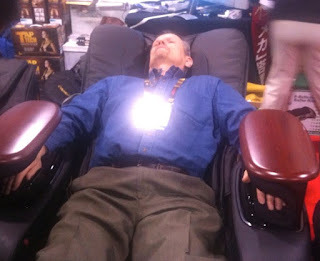 And finally, after walking around the show your body gets pretty stiff and tired, but the good people at Dr. Fuji had the ultimate message chair. I mean this thing worked so well that I felt totally rejuvenated after about 10 minutes. The one American on the booth kept on reminding everyone about the fact that it was Japanese made, not Chinese. And of course, they really do know how to build it better. Pushiest sales people at the show though. I was asked for my order at least 5 times ("Show special. Only $3500. Why you not buy now? I take your order. "), but I have to say, I was tempted. Here's my friend Don D in a state of bliss. That's it until next year. Coming soon, the Winter NAMM report. 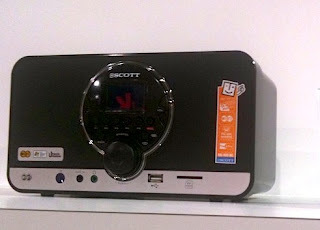 In part 2 of my 2010 CES overview we look at some of the more absurd audio products at the show. Keep in mind that I never even got to the high-end audio exhibits at the Venetian due to a lost show pass. Otherwise, this report would've been filled with examples of $300 power cables, $100 wooden volume knobs and polarized speaker cables that make your stereo sound great even if there is a car parked in your driveway or it's below 50 degrees outside (if you don't get it, this is some of the foolishness that some of these companies try to pull on unsuspecting medical and legal professionals with too much money in their bank accounts). One last thing about the video world that I forgot to mention yesterday - handheld camcorders were everywhere and most of them were capable of 1080p, even the least expensive of them. Tape as a storage medium has gone the way of the CRT, meaning there probably wasn't a machine in entire city of Vegas that uses it. What was interesting is that a few years ago the top floor of the South Hall was flooded with Chinese and Korean manufacturers who all had iPod knock-offs. This year those same manufacturers had small 1080p camcorders. We now officially live in a hi-def world. There was a lot of this kind of table top and portable audio gear around this year, but the difference from other years was that all of it was capable of online connectivity, and/or had flash card or SD card inputs. A reasonable trend for some marginal devices. There was also an ever expanding world of iPod docks, one stranger looking than the next. Who buys these things? Do dealers even carry them? Would a consumer actually consider purchasing such a thing? Does the color really matter? 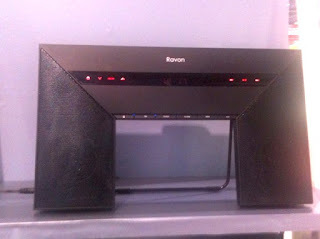 Yet another iPod dock that left me scratching my head. This one was so special that it was behind a plexiglass case. Didn't have a name, model, price or any information. I didn't even know it was a dock until I pressed my face up against the plexi. Here's another Internet radio from an unknown foreign company that makes you scratch your head and wonder, "Why?" For some reason, female DJs were everywhere this year. I guess some manufacturers must think that if a DJ is cool, a good looking girl DJ is even cooler. "Yeah, that's right. It'll help us fill out our order books." This one actually gave me a dirty look when I was taking her picture. Sorry babe, you gave up your privacy when you took this meaningful job. It seemed like whenever there was a female DJ, there was some kind of designer audio product around. Designer headphones were big this year. They don't have to sound good, just look cool and match your outfit. Plaid was the in color this year, in someone's mind at least. 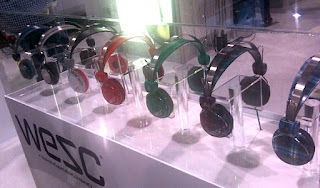 Speaking of headphones, there were a lot of 5.1 surround sound headphones at the show. Having made my living as a surround mixer for a while, this caught my interest until I learned they were aimed only at the gaming market. After I thought about it for a while, I had to agree that was a much better application for pseudo-surround than anything I could think of. Now we come to some of the even more absurd audio products. Once again, it makes you wonder, "Who buys these things?" or even worse, "Why would a company even consider creating them in the first place?" In any event, I hope these are the guys that are building military products for the foreign governments that we're afraid of. First we have a karaoke box, complete with microphone. Why does it look like one of those center channel soundbars for your television sound system? Maybe because it's a center channel karaoke soundbar for your television? Or maybe not. 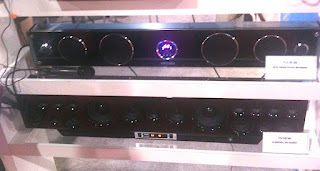 This is only one of many speaker systems that were pretty off the wall in their design. There was no audio pumping through it to tell how it sounds, but I guess it's only supposed to look pretty. Maybe it's there to hold up that Ming vase I bought at a yard sale. 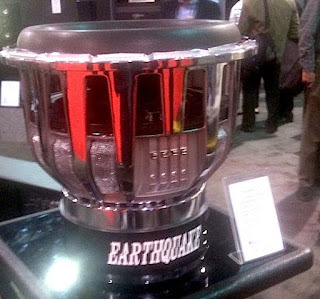 And finally, here's what must be the worlds beefiest subwoofer speaker. This is when you've tried everything to get enough volume from your car stereo to crack your windshield, but nothing will do the job. It must be good though, since the frame is made from silver colored cast iron. I'll take 4 please. Maybe I can blow my windshield right out of its socket. Tomorrow we'll finish up with some interesting accessories that are somewhat less absurd. 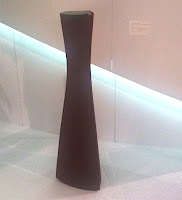 If you've read my overviews before you know that I usually go to a trade show not so much to see a particular product but to get a feel for the trends. This year's Consumer Electronics Show in Las Vegas was no exception. I have a lot of pictures and a many thoughts about the show this time, so it looks like it will take 3 parts to get through everything and still keep it in readable bites. First of all a couple of thoughts about Vegas itself. You can usually tell how the city is doing by watching the billboards on your way into the city. When times were good, Vegas casinos were advertising as far away as Baker (about 100 miles out of town down Route 15), and when times were bad like last year, there were as many empty billboards as there were ones that were occupied. This year I saw just a single empty billboard on the way in. Either the city is doing better, or the billboard company is pretty much giving the space away. Regardless, it made Vegas feel a little more prosperous this time around. And the city did feel a bit more upbeat this year, but that being said, traffic on the streets was really light, even at rush hour on a Friday night. We went through the Wynn and Encore, which were dead, but the Venetian seemed a livelier, although still light considering it was the weekend. It didn't seem like there was any trouble getting a dinner reservation, which is always a sign of how the city is faring. Then again, there are a lot more casinos, places to eat and places to stay than ever before. It's a lot harder to fill to capacity. The CES show had a much larger crowd than last year and the general feeling was that things were looking up a bit. Where last year there was panic, this year there was hope. This was the year of the 1080p television and it struck me like a ton of bricks. 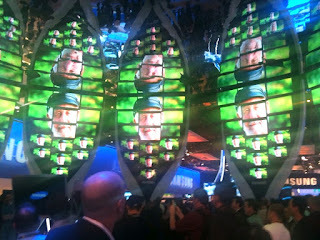 I don't think I've ever been taken by a picture as I was at virtually every booth that featured TVs at CES. Gorgeous, beautiful, to die for picture. I was always passive to TV monitors and Blu-ray players (the only device that can deliver 1080p resolution picture) until this year. Now I want the biggest, baddest picture that I can afford. now if only 1080p was being broadcast. Left is a picture of the Samsung booth. 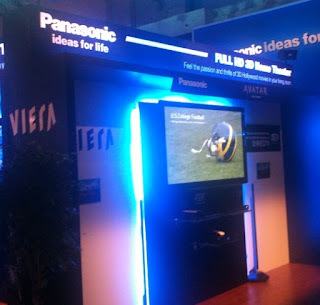 And speaking of the biggest, here's a picture of a Panasonic 152 inch plasma television. You can see an average 6 foot guy standing in front with his arms out, and how he still can't cover the entire width. And the picture was sharp and crisp. I have a wall in my house designated for one when they become available, if only I can figure how to get it without knocking down a wall and using a crane. 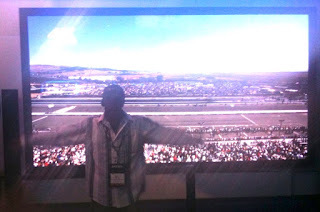 We knew going into the show that 3D was going to be all the rage and it was - even more so. In fact, I'd say it was the overwhelming theme of the show on the floor, especially in the "heavy metal" (big manufacturer) hall. You couldn't turn around without see some blurry picture on the screen, which of course meant you needed 3D glasses to see properly. That being said, 3D has come a long way and really does look pretty good. I do believe that it's in the "parlor game" stage (as industry pundit Shelly Palmer so aptly puts it) in that the picture looks pretty bad if you're watching off axis. You have to be pretty much dead center to really see the 3D effect. And the glasses are a royal drag. I can't see this technology ever becoming popular as long as you have to wear the silly things. Television trends besides 3D and 1080p? Most of the newer models we comprised of LED's, not LCD's, and certainly not plasma (which is relegated to sets beyond 65 inches now). Connectivity? Many sets now come network-ready for connection to Skype, Hulu and other social media video networks (more about this on my Music 3.0 blog). How about ultra-thin? Many TV monitors are now so thin that you have to worry about some serious damage should they ever fall. Some look downright dainty in their thinness. And a serious problem is still the cabling, which takes up far more space than television itself now. Until that becomes almost invisible, no one will ever be able to take real advantage of the slim proportions. 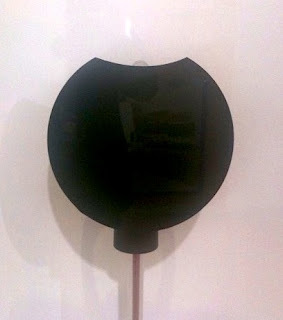 And speaking of slim proportions - OLED televisions are the wave of the future. 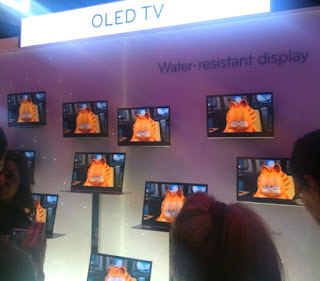 OLED stands for "organic light emitting diode" which is a fancy word for the material that is used to create the displays which will everywhere in due time. OLED displays are literally paper-thin and are used in many of the newer smart phones that we all so love. The problem has always been scaling them larger. Last year Sony showed one that was a bit over 15 inches. This year they were getting beyond 20 inches. One day soon, this is what we'll all be watching, but the technology has to evolve and the price has to come down first. 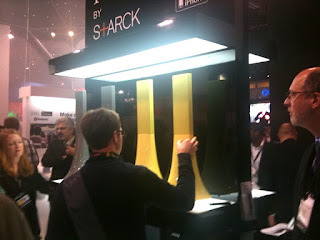 A number of trends at CES only peripherally touched television monitors. The first was the after-market auto area, which up until this year was principally the domain of the audio geeks that wanted their windshields to explode from the loud audio level. That market has thankfully receded somewhat, and was taken over this year by video in the car. CES had displays for the back seat, displays for the front seat, after-market backing-up the car cameras and displays (I want one), and super touch screen displays on the car stereos. Another trend in automotive was a lot more wi-fi for the car and the welcoming of streaming into the vehicle. Satellite radio was present but severely downplayed, a sign of the devolving health of that part of the industry, I think. Another trend was that iPod and iPhone accessories were everywhere, with an entire floor section not exactly dedicated to them, but almost. What was very apparent was that the rest of the industry has ceded that part of the business to Apple, as few "media players" were seen in any booth except some of the small Chinese manufacturers. There were a couple of iPhone accessories that did capture our attention. 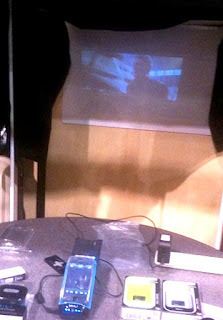 One as a device that turned the iPhone into a small projector that worked pretty well for about $300 as seen on the left. Yet another trend was all electronic things "green" and "sustainable", with an entire section of the floor dedicated to devices that had something to do with either of those catch-words. But every major manufacturer also put on their "green" marketing jackets, and after a while it was easy to not pay attention any more. Much more tomorrow in Part 2. My personal laptop decided that it's logic board needed a vacation on Friday, disrupting my digital life pretty well. While I didn't lose too much data, there are some emails that look like they've gone away. If you've sent me an email in the last 3 days and have not heard back from me yet, please send it again and I'll get right back to you.